We are pleased to present a full stream of Great is our Sin, the latest album by Revocation. Listen below while reading an interview between Revocation singer/guitarist David Davidson and his tattoo artist, Tom Strom, who painted the covers for Great is Our Sin and Deathless. Tom Strom and I first met years ago back when he was working at Uptown Tattoo in Minneapolis. We bonded right away over art and music while I sat for many hours getting getting my arms and legs worked on, sometimes for several days in a row. I loved his tattooing style and also quickly discovered that he was an incredibly skilled painter as well. I asked him if he would be interested in doing some art for Revocation and he ended up painting the album cover for “Deathless” as well as a couple of t shirt designs that we printed up on that cycle. We were all blown away with the art he created for us and we knew we wanted to work with him again on the newest record. Tom once again absolutely floored us with his skill and imagination so it’s my pleasure to present my interview with Tom regarding the creation of the album art for “Great Is Our Sin” as well as his prolific work as a tattooer. Tom! Thanks for taking part in this interview, this is my first time interviewing someone so I’m glad to have you as my guinea pig. Let’s get to it! Thanks for having me here, Dave. It’s great that this is your first interview and I get to be part of it. I feel like we’ve both hit some milestones together over the years with your band and my art so this feels appropriate. We first met years ago when you were tattooing in Minneapolis. Since then you’ve moved to Europe and have worked in a few different shops in various countries. How’s everything been going since the move and how does the tattoo scene in Europe compare to the U.S. ? It’s crazy to think about where life has gone for us both since we met in Minnesota. I definitely miss those days of tattooing you before a show, listening to metal, talking about art, and destroying some good food. Now I’m on a different path and have since moved with my wife to a small coastal town in the Northern part of England where I work full time tattooing and painting with any other free time I have. It’s definitely taken a bit of an adjustment period but it’s been well worth it. The shop I work at now has a lot of energy with a good roster of artists and it feels like a good fit for me. It’s a whole different feel than I’m used to but I like the challenge of it and what it offers. The area I’m living in is really the best part for me so far, though. I’ve always wanted to live by the sea. I love seeing the moods of it and all the unique wildlife that comes with it. A lot of it has already started to seep into my paintings. It’s been a great new source of inspiration for me. I’m excited for the images that will come from it all. You have a very unique style of tattooing. Who were some of the tattooers that really influenced you when you were first starting out and who are some newer artists that you respect? Inspiration in tattooing is a little different. When I started tattooing it was at a time when tattooers drew everything by hand. I especially loved the artists that really pushed the imaginative and illustrative side like Marcus Pacheco and Aaron Cain. They really opened my eyes to what you could do with tattooing outside of the traditional fashion. These days though, I tend to look at artists outside of tattooing. Tattooing has become very mainstream and homogenized in imagery so I like looking at artist’s work that is far removed from anyone else’s. Beksinki will probably always be my favorite. I feel the most connected to what he did and how he approached it. Over this past year though I’ve also been lucky enough to visit the artist homes of Rubens, Duhrer, and Rembrandt along with visiting the Heironymous Bosch Museum. Seeing these places with their collections has been a great learning experience and really helped push me with the technical end of painting. I know from first hand experience how dedicated you are to the craft of tattooing, you make your own needles and pigments etc. Can you describe your approach when working with a new client? Tattooing in all aspects has changed a lot for me over these past two years. I came from the era where you made everything yourself and I loved it. That was when it was still a craft. I’ve loosened up a bit about those things since I left the states and moved forward with new advancements in the field. I mostly use rotary type machines these days and have employed a cartridge type needle system which means I’m no longer making my own needles. I miss that part of it quite a bit. Making your own needles is like making your own weapons for war. It’s very rewarding for me. The cartridge type needle is a much more efficient system these days and allows me to work with a lot more ease and less technical stress. I do still support using hand mixed pigments though. It’s a definite must for me. I don’t have the facilities to mix my own anymore but I use two separate pigment companies that are both hand mixed the traditional way and buy guys who appreciate the craft of tattooing. It’s been a hard choice for me to give up some aspects of the early days of tattooing but I think it’s also a good idea to follow advancements and not be the guy still wearing the wind-up watch. As far as clients go, that part doesn’t seem to change much. I like looking for the people who are interested in working with me as an artist and not a reproduction machine. Whatever idea it is that they have, I like to pull the imagery from my imagination if possible and draw up a design for them that is completely unique. I want them to have something that will stand out from what other people are getting and still keep in mind the basics of what they are looking for. I also look for people that are probably willing to get more than just one piece from me. As you get to know a person more, you can really start to know what their limits are. This allows me to make each piece stronger as I go on with them. You’re also an incredibly skilled painter and sculptor. Can you discuss the importance of versatility as an artist and how one medium might influence another? For example, do you feel that sculpting could be beneficial to your painting? Over the years I’ve definitely become a lot more versatile of an artist. It’s been a lot of fun exploring and trying everything I could get my hands on with each one feeding the other. I started years ago with colored pencil, moved to markers, and then eventually found paint. I still bounce back and forth pretty regularly between watercolor, acrylic, and oils. As I learned each one, there were techniques that I began applying to my tattooing and vice versa. They began feeding each other and really helped me progress in my style. Then I began sculpting. Even though I’m still in the beginning years of that, It’s already proven itself to be helpful in learning form, and how light affects three dimensional objects. This has spilled over into my painting and tattooing as well and helped me push my rendering even further. Its definitely been advantageous for me to take on different mediums. I’m always open to try new products and see what happens. It’s only going to help further my dialogue as an artist. Deathless was the first metal album cover that you ever worked on if I’m not mistaken, what are some of your favorite album covers of all time and why? Deathless was my first metal album cover. I couldn’t be more proud of it. Ever since I was I kid I’ve wanted to paint a cover for a metal band and do shirt designs. It was really the artwork for bands that I discovered first. 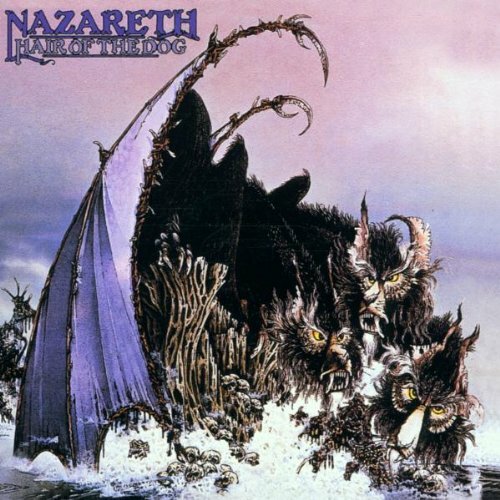 My earliest cover that hit me was for Nazareth’s Hair of the Dog. It’s about as metal of a cover as you could get for a non-metal outfit. I didn’t care. I bought that album solely for that artwork first. I still love it. 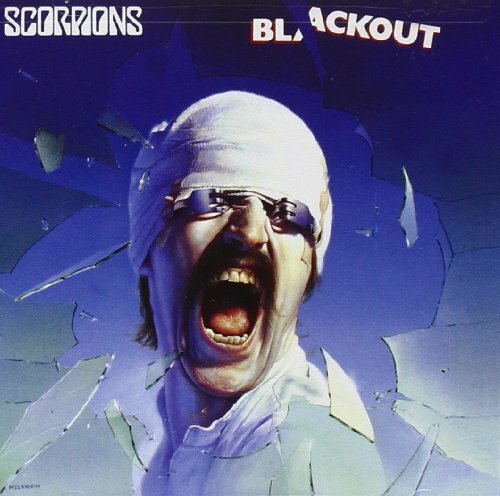 Another early favorite was Scorpions, Blackout. It’s a self portrait of the artist wearing head bandages with bent forks over his eyes and breaking through glass. This is hands down my all time favorite. But, as I got older I started seeing covers from metal bands with real concepts behind them and hand painted to boot. 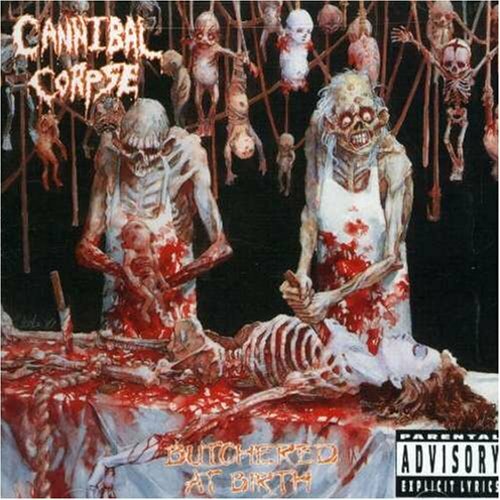 Cannibal Corpse’s Butchered at Birth and Tomb of the Mutilated, Morbid Angel’s Gateways to Annihilation and Death’s Leprosy covers were all permanently etched into my brain after countless hours of staring at them. The artwork was really what dragged me into metal in the first place so getting to take part and hopefully paint some lasting covers to melt some kid’s brain with is a pretty crazy reality for me. Please describe how you approached creating the artwork for Great Is Our Sin What was the process like in the beginning and how did it progress as you were working on it? Painting the Great is Our Sin cover was a step up from Deathless. Deathless was more straightforward in its idea and allowed me to explore and work with one main image. With Great is Our Sin, it was a lot more challenging because the album in itself is a lot more complex thematically. You were looking for something that had the appeal of Heironymous Bosch, whose paintings are the epitome of symbolism and creating full environments to express them in, especially when it concerns heaven and hell. Most of my work is based on choosing a single image and exploiting that as much as I can. So I knew this cover was going to be a challenge. We talked about it more and it soon became that this cover was going to be painted as a triptych which meant I was essentially painting three covers to fold out and be seen as one. I was definitely excited for this challenge. I had just visited the Bosch museum in the Netherlands when all this came about so it was fresh in my mind of how to go about it. You are very thoughtful when you create a piece of art and I know how important symbolism is in your work. Can you discuss the symbolism present in the album cover and how it relates to the lyrical themes on the record? I began by reading through the lyrics and some basic notes that we discussed about visual ideas for them. In the end I was really hoping to tell as much of the album story as I could so I started listing out topics from the lyrics and the images they made me think of. I started with the first track, “Arbitors of the Apocalypse”. This immediately brought up the four horsemen idea but I wanted to give it a twist so I designed the image around the Chimera theme which has it’s own set of symbolism attached to it. I then moved on to “Profanum Vulgus” which spoke of obelisks of avarice which represent man’s quest for greed and wealth. I gave this topic a new rendition of the walking tombstone with tentacles to draw in people. The tombstone just seemed like a really good metaphor for avarice. From there I played with the idea of having veins outreaching from the main tombstone to other floating tombstones as if our reach for wealth never ends. The next element was the eyeball frogs. They are all eyes for the tombstone and what it represents. I pulled a bit of inspiration from Bosch for these creatures. He always had little frog people and eggs involved in his paintings. It was fun mixing that idea to make these little guys that are clamoring to be closest to the tombstone. This is where I started to really get a narrative going. “Communion” came next with the main imagery for the front of the cover. I chose rats to represent religion’s pastors spilling out pages of their gospel to the world. They stand on top of a skull pulpit which is always a good reminder of mortality and a good metaphor to represent religion being above all man. The skull is being feasted on by maggots representing religion’s followers eating up all that religion has to offer. Once I got these images developed, I began to layout the drawing and work on a few other themes from the remaining lyrics. It took a while but in the end, the whole painting pretty much sums up what each song speaks of and gives the whole story of Great Is Our Sin in one full image. If you read through the lyrics and study the painting, you can start to pick out what images belong to which song and what they represent. You also created an alternate pen and ink version of the entire cover which looks absolutely fantastic! Can you talk about why you had the idea to do that and how that process compared to the painted version? After I got the drawing all figured out and worked my way through the painting, I found that I needed a night off from it here and there to think on it. As a fun exercise, I decided to take those extra days and work on an illustrated pen and ink version of the whole cover. I’ve been wanting to practice more in that style so this was a good opportunity for that. It was also really fun to see how they both would turn out. I can’t decide which version I like better. Thanks so much for your time Tom! Any last words? Well, It’s all complete now and I’m excited to see it in full print. I can’t wait to hear what people think of the artwork and how it ties in with the music. I thoroughly believe in you and this band, so hopefully I did you justice. This new album is beyond amazing so hopefully this cover will melt a few brains and stand out among the hordes of death metal covers.